A boning knife is specifically used for removing bones from meat. While it is only used for one task, owning the best boning knife will come in handy more often than you would think. There has always been some confusion about the difference between boning knives and filet knives considering they look very similar. They do share a similar design but the blade of a boning knife is a little bit thicker than a filet knife. Boning knives are also less flexible than filet knives. There are however some fillet knives that are also boning knives. Filet knives are used to remove skin and meat. Sometimes a filet knife can also have the capability to act as a boning knife as well. When a filet knife is used to remove bones, it is usually from fish or chickens. A boning knife will do all cuts of meat. Learn more about the differences and similarities between the two. Think of it this way. A cleaver is used to cut through bones. A boning knife is used to remove bones from meat. A filet knife is used to remove skin, cartilage and smaller bones from meat. A carving knife is used to cut cooked meat with bones. A slicing knife is used to cut cooked meat without bones. You could use any knife to do all of these tasks, but it would not do every job perfectly. A boning knife is more specific to removing bones from meat which in turn is better than any other knife for this task. In this article, we will cover the ups and downs of the boning knives. We will also go over some of the best boning knives available on the market today. There are many different styles of boning knives which all will help to serve a better purpose for a specific cut of meat. For instance, a larger stronger boning knife that would be used to remove bones from Bluefin tuna would not be ideal for removing bones from a chicken. While most boning knives are still able to all jobs related to the task, they still can be somewhat specific. Depending on what you plan on using the boning knife for mainly, will determine the size, style, and construction. For the most part, you want to have the best boning knife with the same features as most other knives. The knife needs to have a full tang so you will know it was made from one piece of metal. This ensures the strength and durability of the knife. You will also want the knife to have at least three rivets hold the handle in place against the tang. This generally means the knife maker created the blade with quality and time. Boning knives are made from all types of materials, but probably best metal to use is high carbon stainless steel. Japanese knives are usually made with this material makeup. High carbon stainless steel will allow the blade to be thinner and more flexible than if made with a low carbon stainless steel. With a thinner blade, the edge retention will be better. This means the edge will be sharper and hold longer so you won’t have to keep sharpening the knife. To learn more about edge retention, click here. The flexibility will come in handy to maneuver around meat and bones when in use. A boning knife is generally a straight-edged knife but can also be curved. When they are curved, this usually means that they will double as a filet knife. The boning knife also has a very sharp point for stabbing when needed. A warranty will help to protect your knife when it breaks. Most quality knife makers offer a lifetime warranty with their knives because they are confident it will last forever. If it doesn’t, they will either fix the knife for you or replace it completely. Many knives come with different accessories. Boning knives need to have a case or sheath to store the knife in. These types of knives are not used every day and must be stored properly and safely. A case or sheath will help to protect the knife until further use is needed. A sharpening steel or a sharpening stone is also helpful for these types of knives. Most will hold an edge fairly well, but it is not uncommon to sharpen the knife every time before use, because they are not used that often. The first knife comes from a very reputable knife maker. Wusthof has been making knives longer than most companies in the knife business. The knife is constructed of high carbon stainless steel, making the blade very flexible. The Blade is also enhanced with precision edge technology which makes the knife 20% sharper with twice as much edge retention. The tang extends through the handle is held in place with three rivets for added durability and precision control. The knife is also equipped with a full bolster which acts as a finger protector during use. While there are no extra accessories with this knife, it does come with a full lifetime warranty against defects and damages. Zwilling Henckels is also a German knife maker, they just have not been around as long as Wusthof. However, this knife is almost identical to the last knife we reviewed. This knife has all the same qualities as the Wusthof 4603 Boning Knife, but with a few differences. The knife is ½ inch shorter which may prove troublesome when trying to cut bones out of larger cuts of meat. But the edge does grade 3 points higher on the Rockwell scale which means it is much sharper. They are both similar in price and both have warranties, so it depends if you want a sharper edge or a longer knife. This is a great knife for the price tag on it and very well could be considered the best boning knife on the market. The knife is constructed of 66 layers of pressed high carbon stainless steel which gives it the cool Damascus look on the blade. It also has a 12-degree edge which grades in at 62+ on the Rockwell scale. This means the knife is crazy sharp and has excellent edge retention. You may never need to sharpen this knife again with mild usage. The knife is also properly made with a full tang and three rivets holding the handle on. The handle is also an ultra-premium G-10 handle that’s is impervious to heat, cold and moisture. Technically you could wash this knife in the dishwasher but that is not recommended. The knife also comes with a padded sheath to store the knife in when not in use. This knife has it all which makes it hard to find the negatives. Shun is a great knife maker as well and has been doing so for decades. This boning knife is a bit different than the others we reviewed. A few features the knife possesses really make it stand out as the competitor. The blade is constructed of 64 layers of low carbon stainless steel which is unusual for Shun. The reason for this is to create a heavier duty boning knife for very large fish and cuts of meat. The knife is still flexible enough to work its way around comfortably though. The edge retention has not slacked though with the VG-10 technology to create a 16 degrees edge. This means the knife is very sharp and will hold the edge for quite some time. The blade is a full tang but is not help on by any rivets against its beautiful walnut Pakkawood handle. The blade also has been designed with a hammered texture to help the knife cut through meat seamlessly by releasing air and moisture. This boning knife from Wusthof is very similar to the other one we reviewed already. However, this one is designed a little differently to take on multiple tasks. The knife has a full tang which extends through the synthetic handle and held together by three rivets. The knife is also constructed of low carbon stainless steel which means it is less flexible but is more durable in the long run. The blade is curved so it can cut through larger cuts of meat and in some cases, double as a filet knife. The edge has also been developed using precision edge technology. This means the edge retention is twice as strong. And of course, with all of Wusthof knives, there is a lifetime warranty that covers all defects and damages. Like all Global knives, this one is made entirely of metal in one solid piece. This can be an advantage for some people or can be quite troublesome for others. The knife I constructed of stainless steel and the handle, which is metal, has been textured with a simple design to help prevent slipping when in use. The blade is 1/2 inch longer than the traditional boning knife but is also slimmer to get in those hard to reach areas. This knife can be quite dangerous for the average person and is not recommended for just anyone. This Dalstrong knife is the little brother of the other knife we reviewed above. With a lot of the same great qualities at half the cost. The blade is constructed on high carbon stainless steel which creates a very flexible blade. The blade has also been curved in order to double as a filet knife if needed. It also has a full tang that extends through the D-shaped handle and secured with one rivet. The edges have been honed to a staggering 15 degrees. This creates a very sharp edge with excellent retention. The blade has a pitted texture to help in the release of air and juices while seamlessly cutting through meat. This knife also comes with a padded moisture protectant sheath for storing when not in use. Dalstrong also guarantees all their knives with a lifetime warranty to protect the knife from any defects or damages that may occur. There is a reason this knife is at the bottom of the list, it is just not a very good knife. Yes, it is the cheapest knife by far, but it does lack in quality and many essential features. The knife is constructed of high carbon stainless steel which makes the blade flexible. But there is no full tang, rivets or a premium handle to complete the knife. The handle is glued to the blade which will cause problems in the future. The edge retention is not that great with this knife either. You will be constantly sharpening this knife every time you use it. The knife also has no warranty protection and does not come with any sort of case or sheath to protect it when not in use. Basically, this is a knife you could find anywhere for dirt cheap and just about any other knife could do its job better than it could. This knife is not recommended to be used as a boning knife and we think it is just a waste of money but if you’re really limited on the budget you can give it a try. 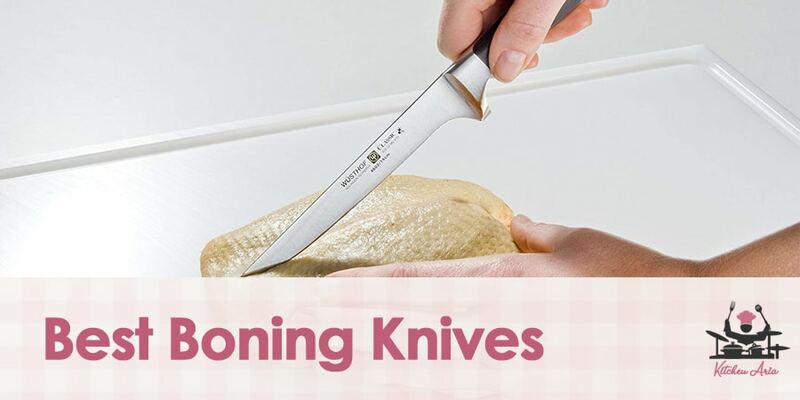 If you are planning to break down a lot of cuts of meat as a butcher or chef then will definitely want to consider purchasing the best boning knife you can find. This will make your job so much easier. However, if this is not the case, then you have many other options to look at. Maybe a multipurpose filet and boning knife will be better for you. Or maybe a lower quality knife at a better price point will do just fine for you. You will want to choose the best fillet knife to best suit your needs. There many different brands all with different types of construction so choose wisely. Knives can become quite pricey. Make sure to get one you will not only be comfortable with but will also last forever.